If you have a close friend or family member who loves craft beer or is a microbrew enthusiast, he or she will appreciate thoughtful and enticing gifts of Fat Tire beer. 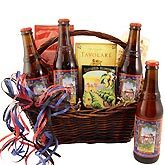 Fat Tire is one of America’s most popular beers, and a gift basket with this microbrew as the centerpiece will not soon be forgotten. Whether it is a birthday gift, a thank-you gift or just a little something to let friends know you are thinking about them, our gifts are unique and classy, and you have a large selection of baskets and beers from to choose. 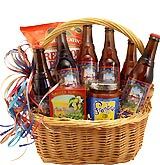 Beer connoisseurs across the country are raving about the beer baskets available from BeerGifts.com. 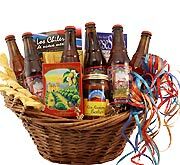 Beer baskets filled with Fat Tire craft beer and tasty snacks or glassware make it is easy to celebrate any occasion or throw an impromptu party just because the workday has finished. 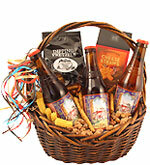 When you want a New Belgium gift box or basket from BeerGifts.com, you have several options from which to choose. If you are looking for a budget gift for just want something more intimate, we have the Fat Tire Twosome, which includes two bottles of Amber Ale and assorted nuts, and Fat Tire for Two, which is a more eloquent package featuring two bottles of beer and a two-piece set of New Belgium Glasses. One step from the baskets for two is the Fat Tire Trio. The Trio comes with three bottles of beer and several crunchy snacks, including cheese straws and pretzels. 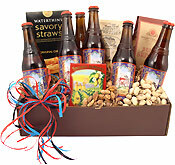 We also have several deluxe gift baskets and boxes for the most discerning of craft beer drinkers. 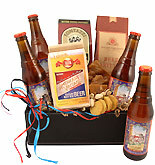 The Vintage Fat Tire Brew Box includes four bottles of Fat Tire with crackers, pub-style snacks and Annette’s Chocolates. However, the Fat Tire Beer Bash is an instant party just waiting to be enjoyed. It includes six beers from the New Belgium Brewing Company and premium snacks. At BeerGifts.com, we take pride in helping you celebrate special occasions with friends and family by offering unique gifts based on popular beers from around the world. Our gifts with Fat Tire are available for people with any budget, and we always strive to bring you the finest products and the best possible customer service. If you have any questions about our gift baskets or would like to buy a beer gift but can’t decide, give us a call or contact us by email via the simple form on our website. We are waiting to hear from you.